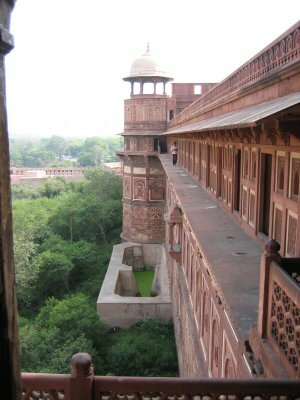 Tour of India and Nepal – Agra and the Taj Mahal. 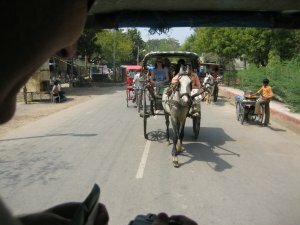 Our train arrives at Agra, and we travel by mini-bus to our hotel. Everyone was very tired from the journey, but the excitement of the day, kept everyone awake. 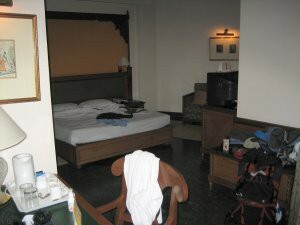 Once again, the standard of the hotel accommodation was superb. I almost felt bad, that I was wearing my scruffy travel clothes, and this chap had gone to such lengths over his attire. We had 90 minutes free time, so I unpacked my gear, had a bath, and then an hours sleep. 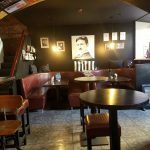 I just had time to update my journal, and then off we went. Our guide had advised us, that due to the number of tourists that visited Agra, the people there, had become a bit tourist dependent. She advised that we be wary for pushy people. Some of them were a little annoying, and would stand in front of you, but just as Indirah had said, they were never intimidating or threatening. 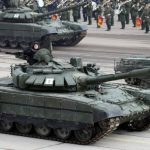 Made me think, of the number of people who avoid this kind of holiday, and go to spain, thinking they will avoid hassle, and then find not only have they missed some of the worlds most beautiful sight’s but they are also press ganged into visiting nightclubs, sometimes with intimidation. 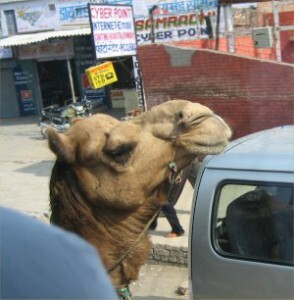 Due to environment concerns, motor vehicles are not permitted within a certain distance of the Taj. 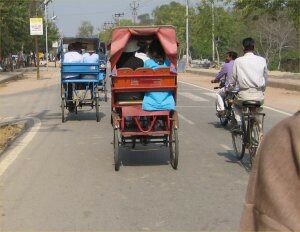 Here my friends Angela and Paul, sit “comfortably” as they are peddled to one of the worlds most beautiful sights. 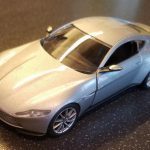 I found that the correct “driving” technique, was for the driver to stand one the pedals, until the vehicle go moving, and then using stored momentum, simply steer the vehicle to the Tarj. 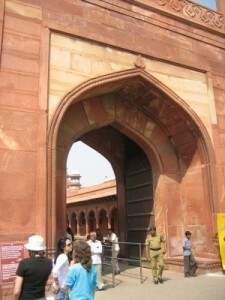 The gate leading to the Taj Mahal. Security was, as you can imagine, quite strict around the Taj Mahal. The staff there, though, we very amenable and friendly. Here a security office agree’s to pose for a photo. 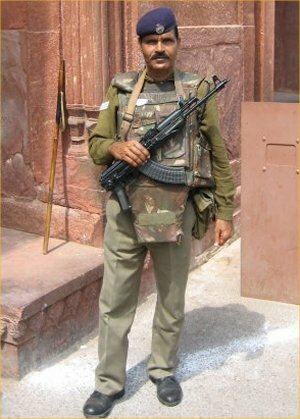 The bullet proof vest, and heavy calibre assault rifle (no hand gun here) show that he was a force to be reckoned with. 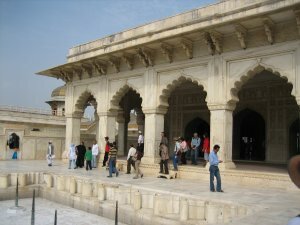 Accommodation created to house the architects and builders of the Taj Mahal. First view of the Taj, as we enter the main viewing area. 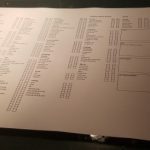 As most of you know, my travels argent spontaneous, and they form part of a bluelist (A list of all the places I have ever wanted to visit in my life). That said, not all the places on the bluelist are of equal importance/significance. 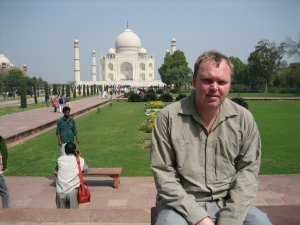 Sitting in front of the Taj Mahal, is easily in the top ten, of a list of activities which number more than 3000 from around the world. 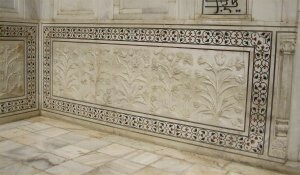 Inside, this “wallpaper”, was hand carved from marble. 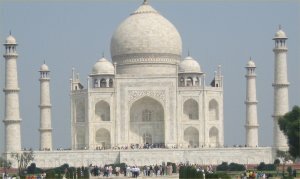 A photograph of the taj, from a slightly different angle. 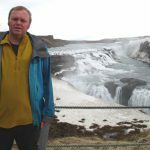 During my travel photography course, I had been told that every famous place has some “standard views” and that we should try to photograph places from alternate angles. 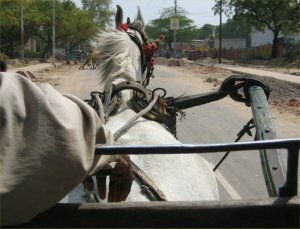 We travel back, this time in horse and cart. You can see from the main on this horse, the speed we were going. 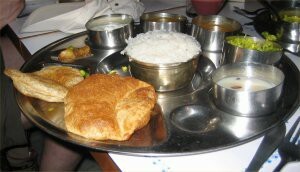 For lunch, our guide organizes a Southern Indian meal. It was made up of different sorts of pastry. 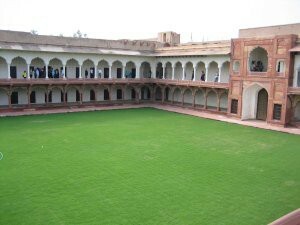 The internationally famous Agra fort. 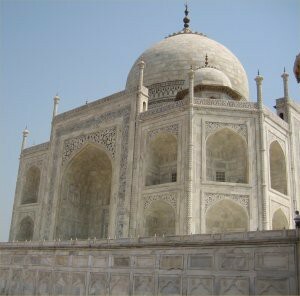 I had been looking forward to this, and too be honest, I enjoyed it more than the Taj, as there was much more to see and do. 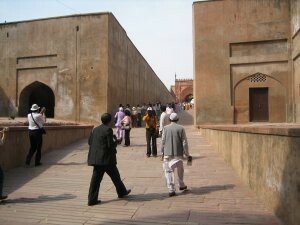 The main walkway into the fort. 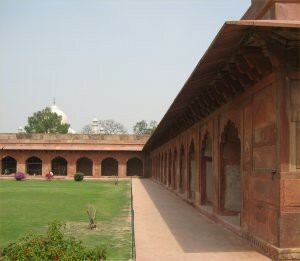 The superb façade of the outside of the fort. The chap in the picture, had stepped over a security barrier, to take a picture (he was taking his life in his hands, as you can see). The castle was originally protect by a moat and 2 walls. 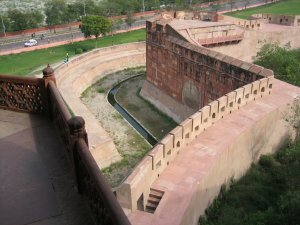 The moat contained Crocodiles, the wall was 70 feet high, and between the outer and inner wall, there were tigers roaming. I have visited Beaumaris castle in Anglesey, which was said, had it been completed, to be the most strategically secure castle in the world. 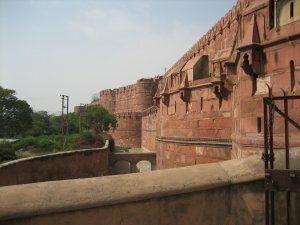 Having seen the defences at the Agra fort, I wonder how that could be possible. 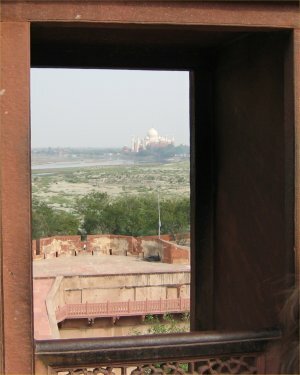 From one of the walkways around the fort, a “window” gives us a view of the Taj Mahal. The pool in the centre, was originally filled with water. 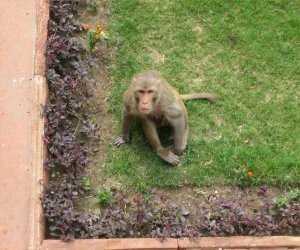 One of the baboons that live at the fort. In the morning, the Indian equivalent of bean’s on toast. 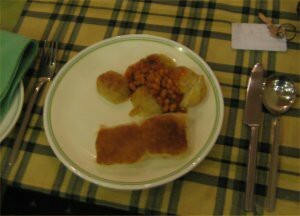 A very spicy bean casserole, combined with traditional bread. 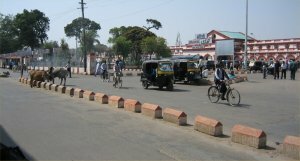 Throughout the trip, it wasn’t hard to see how India is becoming the economic powerhouse of the region. 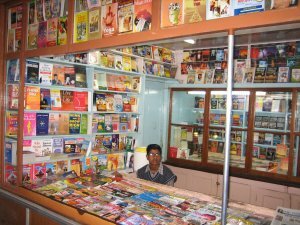 At the railway station, was this bookshop, which contained a wealth of motivational, management and business books, for people to buy and read on the train.